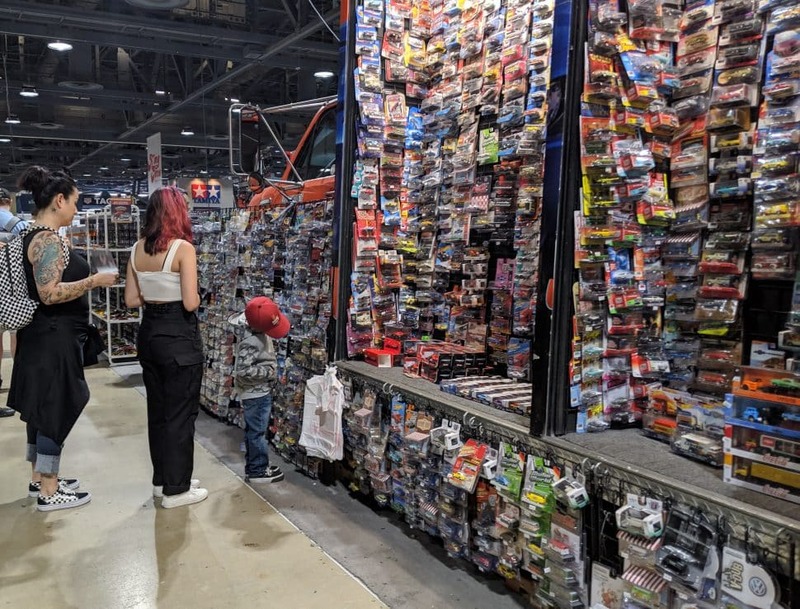 Burning Rubber Toy Company sells thousands of toy and die-cast cars at the Long Beach Grand Prix on April 13, 2019. Photo by Valerie Osier. For some vendors at the Grand Prix, they’re there to give you some free swag in exchange for just a bit of your personal information: Give them your email, spin the wheel, get a prize. But for others, the Grand Prix is part of a decades-long tradition that’s also a key part of their business. 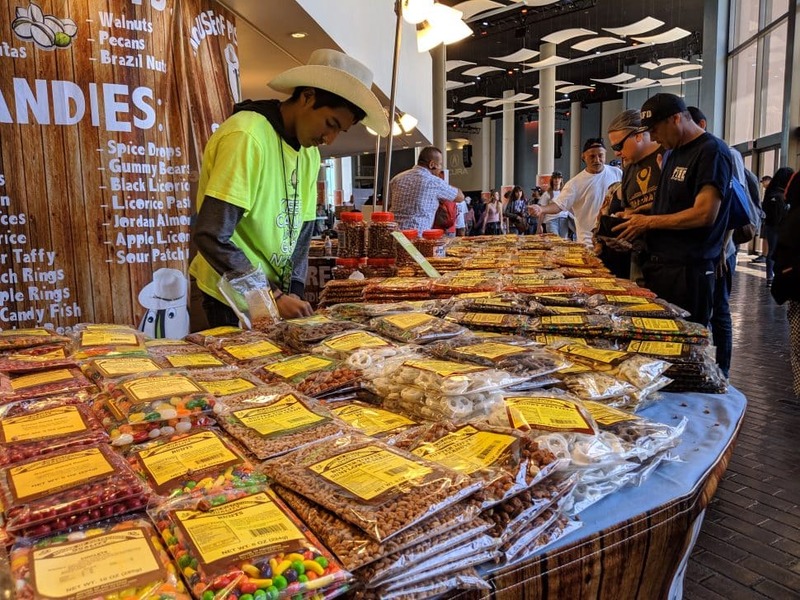 House of Pistachios sells flavored nuts, dried fruit and candy at the Long Beach Grand Prix on April 13, 2019. Photo by Valerie Osier. Brothers Viraj “IG” and Robby Sehgal, co-owners of the House of Pistachios, have been at the Grand Prix since the ’80s. They have tables filled with nuts, flavored pistachios, dried fruit and colorful candies and can usually be seen passing out samples of their signature toffee peanuts. Their parents moved from India to La Habra in 1976, where their mom became the first Indian woman to work for the La Habra Police Department and their dad worked for a bank, IG Sehgal said. But they wanted the freedom to be able to home school their children, so they started their own business selling nuts flavored with Indian spices at markets and fairs. “I don’t remember my childhood without these shows,” IG Sehgal said. Even his birthday, which always fell on the same weekend as the Los Angeles County Fair, was spent helping his parents and celebrating at the fair. Their business now goes to about 45 shows and events each year, IG Sehgal said. The brothers have branched out on their own a bit: with inspiration from their mom’s recipes, they created their signature toffee peanuts, called “Toffee Boy.” Their mom made the recipes for the most of the flavored pistachios, but the brothers created the newest one: Tequila Pistachios. Another vendor who has kept up reappearances at the Grand Prix calls himself the “King of Toy Cars.” Husband and wife team Paul and Katie Meck bring their massive toy truck—that is, a truck full of toys—to the lifestyle expo every year. They roll up the sides of their revamped water truck to reveal thousands of toy cars. He started a business at age 7 with his dad in Pennsylvania selling baseball cards. At age 15, when that market took a turn, he pivoted to toy cars, since he was selling the cards at car shows, and quickly “took over” that market in the state. “Now my son is 8 and he’s just getting into baseball cards. He’s like a carbon copy of me,” Paul Meck said. As an adult, Meck worked in the mortgage industry, but after that collapsed during the Great Recession, he said he missed cars. His dad also sold toy cars in Pennsylvania and wanted to retire, so he was able to get his inventory, too. Then he bought an old water truck and refitted it for toy cars. He and his wife were able to quickly build their business, Burning Rubber Toy Company, at car shows and then, as of two years ago, on eBay too, selling about 30,000 cars online. “We know cars,” Kate Meck said, noting the importance of really knowing the cars they sell—the real versions and the toy versions.